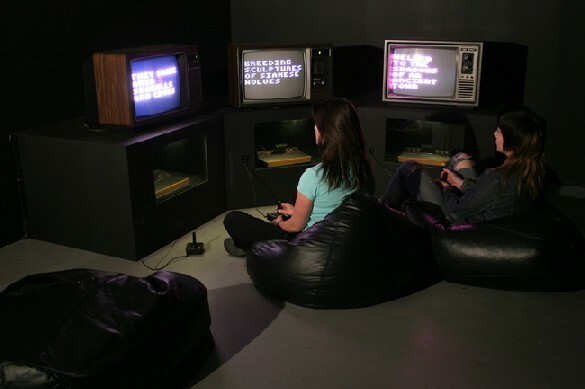 “Super Atari Poetry” (3 Atari 2600, Cartridges, Joysticks, TVs). Each cartridge contains a group of verses that are constantly changing colors which can be manipulated using a joystick. In this way, the audience can either freeze/move the colors or just move forward and backward the sentences. The reading of the 3 verses printed on the screens produces an interactive and coherent poem that’s always changing its meaning and chromatic structure. By Yucef Merhi.